If you have run out of iCloud storage for backups of either your Mac or iOS stuff, you can now easily manage existing backups and data for all devices right on your Mac from OS X. 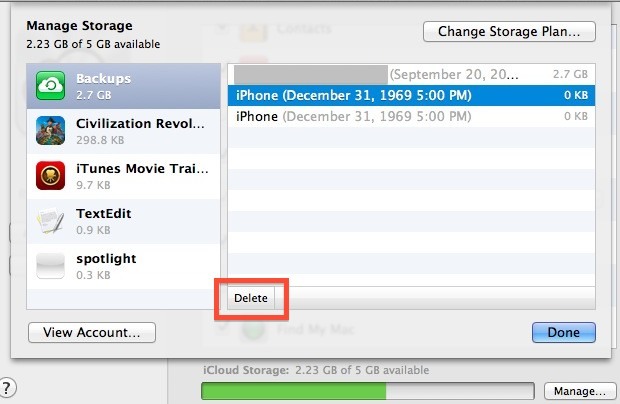 The same iCloud manager also lets you view and delete individual files from apps that are iCloud enabled. Everything in iCloud will be found here, whether it’s from Mac OS X or iOS, apps, files, manual backups, games, or whatever else is stashed online with the service. You can also easily upgrade your iCloud plan from this preference window, to do so just click on “Change Storage Plan”. The free option provides 5GB, which is nice but realistically too small for more than one iOS device and Mac to share. At a minimum you’ll probably want the 15GB option, or else you’ll be frequently deleting backups to make room for new ones or even resorting to backing up iOS devices to a computer when the iCloud space is used up. I followed this tip but in my case the numbers don’t add up. In fact they hugely out. If that’s all I’m using, how come only 15.39MB out of my 5GB is still available? And what can I do about it? I need to downgrade to 5gb storage plan asap! No money to pay for plan! !